Japan's top government spokesman says a partial meltdown is likely under way at second reactor affected by Friday's massive earthquake. Some 170,000 people have been ordered to evacuate the area within 12 miles (20 kilometers) of the plant. The plant is 170 miles (270 kilometers) north of Tokyo. 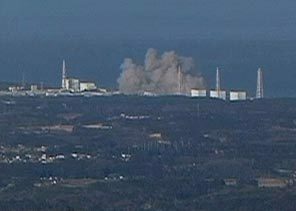 IWAKI, Japan (AP) - Cooling systems failed at another nuclear reactor on Japan's devastated coast Sunday, hours after an explosion at a nearby unit made leaking radiation, or even outright meltdown, the central threat to the country following a catastrophic earthquake and tsunami. The Japanese government said radiation emanating from the plant appeared to have decreased after Saturday's blast, which produced a cloud of white smoke that obscured the complex. But the danger was grave enough that officials pumped seawater into the reactor to avoid disaster and moved 170,000 people from the area. Japan's nuclear safety agency then reported an emergency at another reactor unit, the third in the complex to have its cooling systems malfunction. To try to release pressure from the overheating reactor, authorities released steam that likely contained small amounts of radiation, the government said. 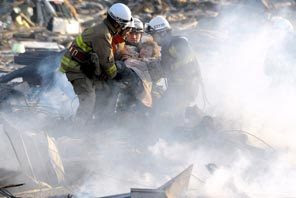 Japan dealt with the nuclear threat as it struggled to determine the scope of the earthquake, the most powerful in its recorded history, and the tsunami that ravaged its northeast Friday with breathtaking speed and power. The official count of the dead was 763, but the government said the figure could far exceed 1,000. The explosion at the nuclear plant, Fukushima Dai-ichi, 170 miles (274 kilometers) northeast of Tokyo, appeared to be a consequence of steps taken to prevent a meltdown after the quake and tsunami knocked out power to the plant, crippling the system used to cool fuel rods there. The blast destroyed the building housing the reactor, but not the reactor itself, which is enveloped by stainless steel 6 inches (15 centimeters) thick. Inside that superheated steel vessel, water being poured over the fuel rods to cool them formed hydrogen. When officials released some of the hydrogen gas to relieve pressure inside the reactor, the hydrogen apparently reacted with oxygen, either in the air or the cooling water, and caused the explosion. "They are working furiously to find a solution to cool the core," said Mark Hibbs, a senior associate at the Nuclear Policy Program for the Carnegie Endowment for International Peace. Nuclear agency officials said Japan was injecting seawater into the core - an indication, Hibbs said, of "how serious the problem is and how the Japanese had to resort to unusual and improvised solutions to cool the reactor core." Officials declined to say what the temperature was inside the troubled reactor, Unit 1. At 2,200 degrees Fahrenheit (1,200 degrees Celsius), the zirconium casings of the fuel rods can react with the cooling water and create hydrogen. At 4,000 Fahrenheit (2,200 Celsius), the uranium fuel pellets inside the rods start to melt, the beginning of a meltdown. Chief Cabinet Secretary Yukio Edano said radiation around the plant had fallen, not risen, after the blast but did not offer an explanation. Virtually any increase in dispersed radiation can raise the risk of cancer, and authorities were planning to distribute iodine, which helps protect against thyroid cancer. Authorities ordered 210,000 people out of the area within 12 miles (20 kilometers) of the reactor. Among those waiting to leave was Reiko Takagi, a middle-aged woman standing outside a taxi company in Iwaki, about 19 miles (30 kilometers) from the nuclear plant. "Everyone wants to get out of the town. But the roads are terrible," Takagi said. "It is too dangerous to go anywhere. But we are afraid that winds may change and bring radiation toward us." It was the first time Japan had confronted the threat of a significant spread of radiation since the greatest nightmare in its history, a catastrophe exponentially worse: the 1945 atomic bombings of Hiroshima and Nagasaki by the United States, which resulted in more than 200,000 deaths from the explosions, fallout and radiation sickness. Officials have said that radiation levels at Fukushima were elevated before the blast: At one point, the plant was releasing each hour the amount of radiation a person normally absorbs from the environment each year. The Japanese utility that runs the plant said four workers suffered fractures and bruises and were being treated at a hospital. Nine residents of a town near the plant who later evacuated the area tested positive for radiation exposure, though officials said they showed no health problems. Two days after the magnitude 8.9 quake, there were grim signs that the death toll could soar. One report said no one could find four whole trains. Others said 9,500 people in one coastal town were unaccounted for and that at least 200 bodies had washed ashore elsewhere. The government said 642 people were missing and 1,426 injured. Atsushi Ito, an official in Miyagi prefecture, among the worst-hit states, could not confirm the figures, noting that with so little access to the area, thousands of people in scores of towns could not yet be reached. "Our estimates based on reported cases alone suggest that more than 1,000 people have lost their lives in the disaster," Edano said. "Unfortunately, the actual damage could far exceed that number considering the difficulty assessing the full extent of damage." Japan, among the most technologically advanced countries in the world, is well-prepared for earthquakes. Its buildings are made to withstand strong jolts - even Friday's, the strongest in Japan since official records began in the late 1800s. The tsunami that followed was beyond human control. With waves 23 feet (7 meters) high and the speed of a jumbo jet, it raced inland as far as six miles (10 kilometers), swallowing homes, cars, trees, people and anything else in its path. "The tsunami was unbelievably fast," said Koichi Takairin, a 34-year-old truck driver who was inside his sturdy, four-ton rig when the wave hit the port town of Sendai. "Smaller cars were being swept around me. All I could do was sit in my truck." His rig ruined, he joined the steady flow of survivors who walked along the road away from the sea and back into the city Saturday. Smashed cars and small airplanes were jumbled against buildings near the local airport, several miles (kilometers) from the shore. Felled trees and wooden debris lay everywhere as rescue workers in boats nosed through murky waters and around flooded structures. The tsunami set off warnings across the Pacific Ocean, and waves sent boats crashing into one another and demolished docks on the U.S. West Coast. In Crescent City, California, near the Oregon state line, one person was swept out to sea and had not been found Saturday. In Japan early Sunday, firefighters had yet to contain a large blaze at the Cosmo Oil refinery in the city of Ichihara. Four million households remained without power. The Russian news agency RIA Novosti reported that Japan had asked for additional energy supplies from Russia. Prime Minister Naoto Kan said 100,000 troops had joined the rescue and recovery efforts, helped by boats and helicopters. Dozens of countries offered to pitch in. President Barack Obama said one American aircraft carrier was already off Japan and a second on its way. Two other U.S. rescue teams of 72 personnel each and rescue dogs were scheduled to arrive later Sunday, as was a five-dog team from Singapore. Aid had just begun to trickle into many areas. More than 215,000 people were living in 1,350 temporary shelters in five prefectures, the Japanese national police agency said. "All we have to eat are biscuits and rice balls," said Noboru Uehara, 24, a delivery truck driver who was wrapped in a blanket against the cold at a shelter in Iwake. "I'm worried that we will run out of food." The transport ministry said all highways from Tokyo leading to quake-stricken areas were closed, except for emergency vehicles. Mobile communications were spotty and calls to the devastated areas were going unanswered. Although the government played down fears of radiation leak, Japanese nuclear agency spokesman Shinji Kinjo acknowledged there were still fears of a meltdown - the collapse of a power plant's systems, rendering it unable regulate temperatures and keep the reactor fuel cool. Yaroslov Shtrombakh, a Russian nuclear expert, said it was unlikely that the Japanese plant would suffer a meltdown like the one in 1986 at Chernobyl, when a reactor exploded and sent a cloud of radiation over much of Europe. That reactor, unlike the reactor at Fukushima, was not housed in a sealed container.